Do you ever have projects that you put off for…oh…say about 5 years? 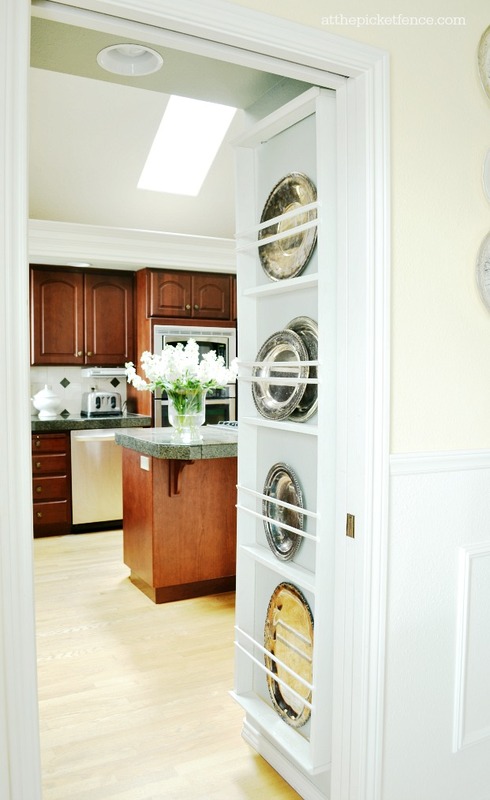 In our kitchen there is a narrow wall that you pass by on your way to the dining room. Or if you are coming from the dining room you pass it on the way to the kitchen. You get the idea! I like to call it ‘The Forgotten Wall’. Just something you pass by on your way to bigger and better things…like coffee. Oh sure, I made half-hearted attempts at giving it some attention. There was the chalkboard that looked fine but no one ever stopped to read all of my beautiful quotes carefully written with hopes of encouraging and inspiring. Because it’s a wall you just pass by after all. Well, friends, I think it is safe to declare that ‘The Forgotten Wall’ is now my most favorite part of my entire kitchen! It is forgotten no more! It only took me 5 years and one long afternoon to help the wall fulfill it’s destiny by making a very basic wall rack. 1. 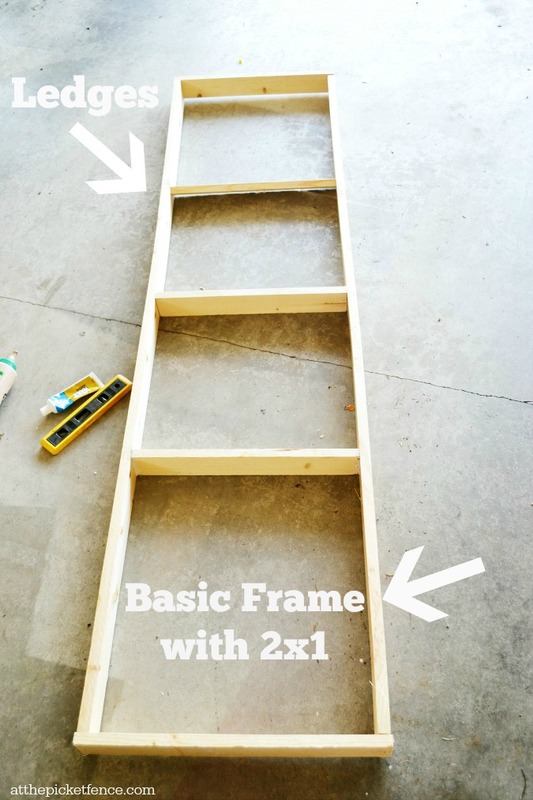 Build a simple frame using the size of wood appropriate for your space. Because this is a narrow area I went with 2×1’s. I had Lowes cut the ledges to fit the width in between the size and also 2 additional pieces for the top and bottom. 2. 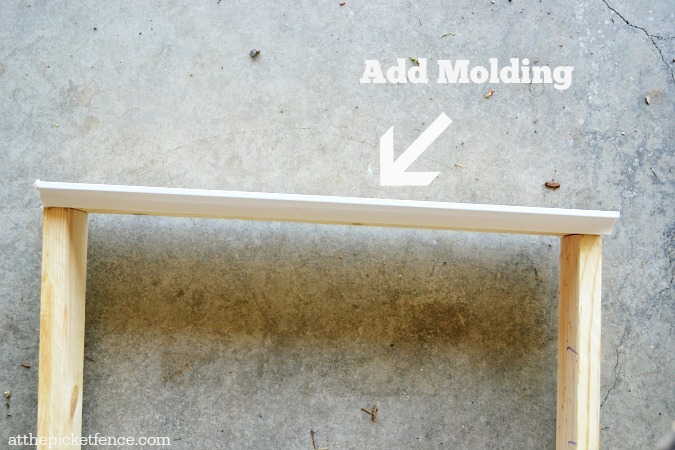 Cut molding to trim out the top and bottom and add detail to the frame and attach with wood glue. 3. 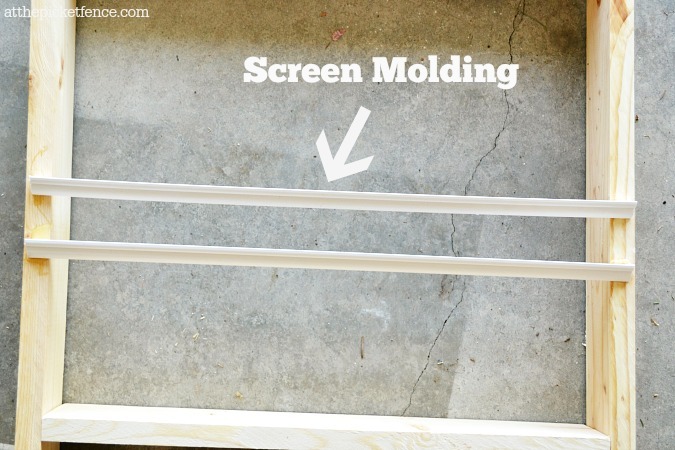 2 rows of screen molding cut to size and attached with nails or wood glue hold the plates in place. I painted the entire thing a lovely shade of ivory and hung it right up on that forgotten wall. I think I might have heard it sigh. It was a sigh of relief…of satisfaction. Because it finally looked like it was always meant to look. This incredibly simple and basic plate rack that only took 5 years and one long afternoon to make looked like it had always been there. It looked like it belonged. And that’s really what we all want, after all, isn’t it? To know that we ‘belong’…that we’re special, remembered. We don’t want people to just pass us by without really noticing us. Because we all know how absolutely amazing it is when someone recognizes our capacity for great things. Our ability to truly shine. And we also know (or we should know!) that it feels even better to be the one to recognize the potential in someone else…to speak it into their life…and to watch them shine! 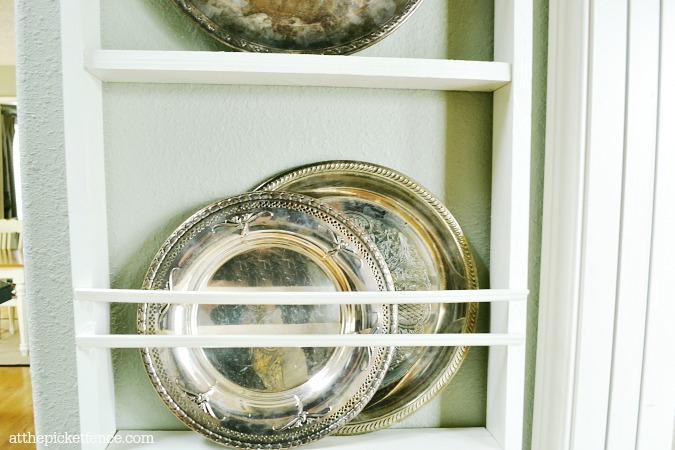 21 Comments on "DIY Wall Plate Rack"
I LOVE IT Vanessa and love the silver platters you added to it!! That looks fantastic! I’ve seen a couple of other people do the same thing and it always makes me stare around and try to decide where I could do the same. What a fun way to feature platters and plates that you love. Now, if I only had the wall space to hang this~ Thanks for sharing! Thank you for sharing this! I really like it and have a spot where this would work great. Vanessa, this is so awesome! 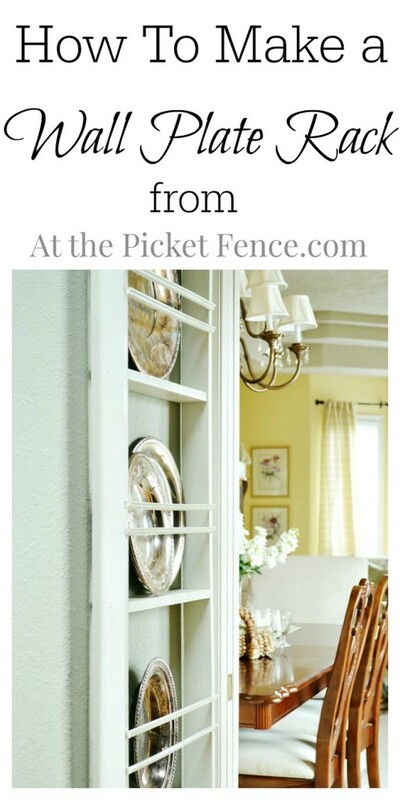 !….I so love it….great idea and looks beautiful….Amazing job…pinning away! It’s beautiful, perfect, and I love it. I am searching for the wall in my house. May have to be a dining room wall, but I have beautiful pieces to share. Oh my gosh. I want one of these! Not sure I could make it myself though! It’s totally perfect on that wall and I adore the silver trays. Well done girl! Vanessa, your wall plate rack is amazing! You are AMAZING! 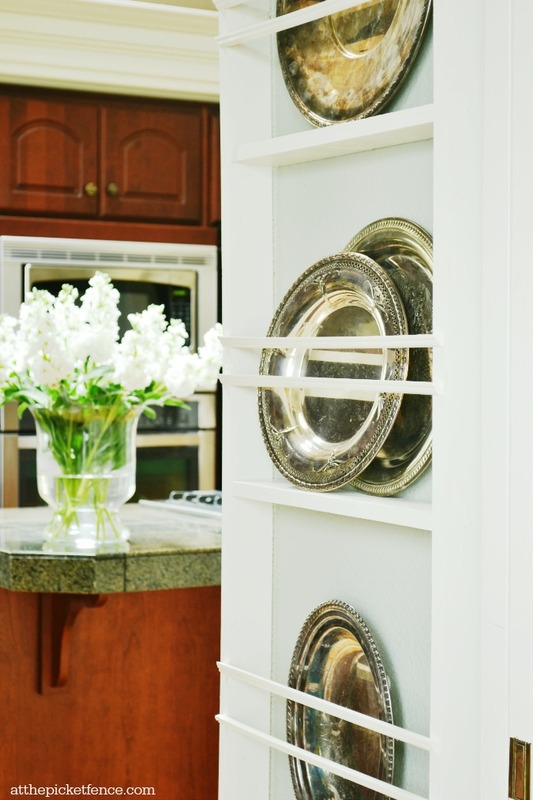 What a perfect place for a plate rack and I love the silver! I’m running through walls in my house to do the same!!!! 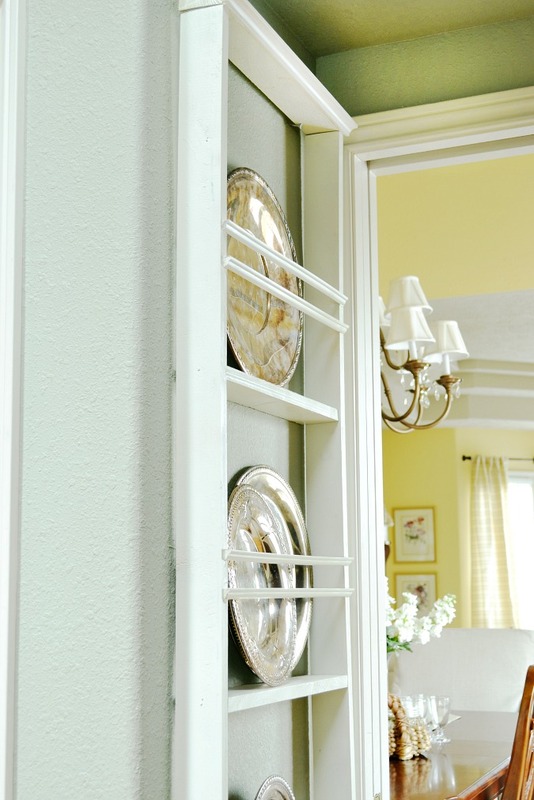 So now I’m eyeing walls in my kitchen and dining room for a possible diy plate rack! Love this idea and think I could actually make one myself too! Vanessa, you are brilliant! What a wonderful use of that little space. Bonus: a place to display and store those big trays. It really does look as if it’s always been there. And great lessons learned from it as well! Nice project for a small unused space. It adds a nice decorative touch as well. Love it and who knew how simple — my only question is how did you attach it to the wall? I’m going to do this in the kitchen between 2 windows. I just saw the article in Better Homes and Gardens and loved it idea. Only question is how did you attached it to the wall? Love it, but I have a question … what’s the paint color on that wall? I love it too! !